A judge has refused to restore the driving licence of a former boy-racer who in 2004 killed four friends, including Banbridge teenager Ian Currie, in a 100mph smash described as one of Northern Ireland’s most horrific crashes. Judge Desmond Marrinan told 31-year-old Kurtis Armstrong that while he was a changed and more mature person, “in the overall context and particular seriousness of this case”, he did not think “it would be just” to interfere with his original 12-year driving ban. Armstrong, of Ivy Hill on the outskirts of Lisburn, was jailed for seven years in May 2008, for causing the deaths of his friends during a lunchtime spin to show off his new ‘hot hatch’ car. The court was told he wanted his driving licence back to help out “in the family limousine business”. However, the Antrim Crown Court judge said while he believed Armstrong was to take over the business from his ailing father, he was being sought to “re-energise this company” which had not been a viable trading company for some years. Judge Marrinan said that as a result “the core of the case (Armstrong’s) has not been made out”. Armstrong’s father James had earlier described his son as a changed person . . .“he was a boy (then), now he’s a man”. Armstrong was only 19 when he caused the deaths by dangerous driving of his friends Graeme Waring, 17, Ian Currie, 18, and 19-year-olds Philip McMurray and Joseph McDonald on February 24, 2004, just three days after buying the white Vauxhall Corsa SRI car. 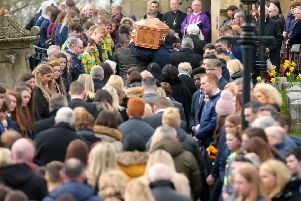 They were returning to the Lisburn Institute of Higher and Further Education, where they were all students, when a speeding Armstrong lost control of the vehicle as it went up Wolf Hill in Ligoniel and down Ballyhill Road near Belfast. The car flew through the air after it crossed a verge and landed in a field where it smashed into trees, uprooting one of them, before landing on its roof. Lawyer Nessa Fee, objecting to the application on behalf of the PSNI, said ‘R’ driver Armstrong claimed he was doing only 45mph at the time of the accident, while an expert had estimated he’d been travelling in excess of 100mph. Ms Fee also revealed that Armstrong had convictions for driving without due care and attention, failing to stop and report an accident and driving without insurance, and that the victims’ families said they were “shocked and upset” on hearing of Armstrong’s application.